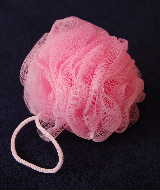 Our nylon scrunchies are perfect for using with our handmade natural soaps. 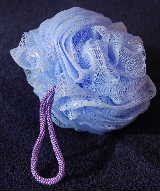 Simply rub the soap across the scrunchie, then use like a bodywash. 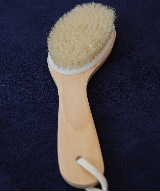 The perfect little mini brush for gently removing dried skin on the feet. We'd recommend a free draining soap dish like this one, to allow our natural handmade soaps to dry out between uses - they'll last for much longer. 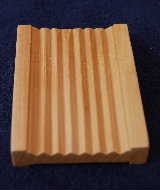 Another soap dish design which allows natural handmade soaps to dry out between uses. 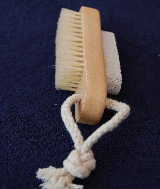 A lovely duo mini brush and pumice stone on a rope. Particularly good for gently removing dry/hard skin and cleaning the nails. 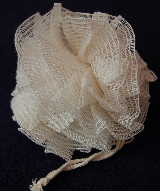 This is a cotton alternative to our nylon scrunchies. 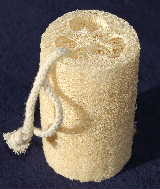 Use a dampened loofah to gently smooth skin all over the body. 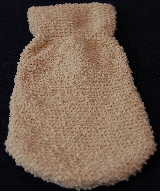 A beautiful soft mitt that's perfect in the bath or shower, and is very gentle on children's skin. 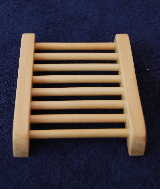 We'd recommend this for use with our natural handmade soaps. 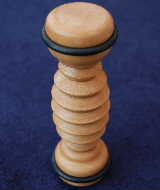 Use our wooden foot roller for some gentle reflexology at home. Very simple to use, simply use the foot to move the roller forwards and backwards (whilst you are sitting down), to sooth tired and aching feet. 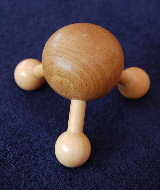 Can be used with or without massage oil, to gently stimulate the skin and sooth tired muscles. Perfect for any area of the body that's susceptible to cellulite. Is particularly effective when used with our Detox massage oil, to improve blood circulation in sluggish skin. 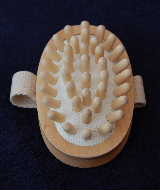 Skin benefits from dry skin brushing, to improve blood circulation. 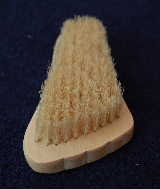 This angled wooden brush has soft bristles, and can be used morning and evening, ideally before bathing. Always use gentle upward strokes, that work towards the heart from the hands and feet.